Alternative GenHist: Were the British Israelites Wrong? 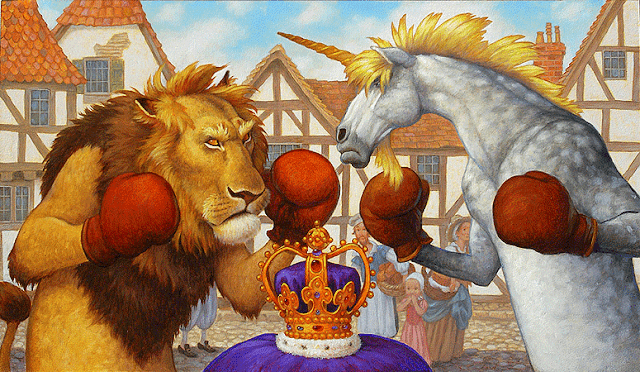 Were the British Israelites Wrong? I have always been fascinated with the fate of the Lost Ten Tribes of Israel since I was a teenager. I first became interested in the British Israelite teachings when I read a book by a British Israelite writer called "Christians Awake"by Gilbert Saddler when I was about 13 or 14 years old. I was to find out that my family had been followers and believers in the British Israel identity for at least 4 generations on my mother's maternal side. However one of my ancestors on my mother's paternal side had in 1800 gone with his wife and two children to look for the Lost Tribes amongst the Ojibwa Indians of Wisconsin, as they were involved with the Albury movement of Sir Henry Drummond that led to the foundation of the Catholic Apostolic Church which were also interested in this topic of the identity of the Lost Tribes. 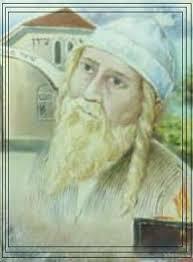 Another ancestor had been influenced and converted by the teachings of Joseph Wolff of the London Jews Society who was also fascinated by the search for the Lost Tribes. I became involved with the British Israel World Federation and spent many hours at their bookshop in the city centre and received literature from England, South Africa and Canada on a regular basis. Even after I became a Catholic I still retained many of my British Israelite ideas on the lost Tribes and I also became involved in the orthodox Jewish led group called Brit-Am in Israel and I even was a guest speaker on Davidic genealogy at one of their meetings in Jerusalem in 2002. It wasn't until the advent of dna testing (I became interested in it from 2008), that I started to change some of my understandings about the identity of the Tribes of Israel. As a British Israelite I believed that the British belonged in the main to the Lost Tribe of Ephraim and were the fulfilment of the Biblical prophecy that Ephraim would be a nation and a company of nations. They were the Birthright people of God. However now due to my further study of the Tribes and their migrations using dna evidence I no longer believe that the British and Irish are Ephraim (of course there are certain families and clans within Britain who are Ephraimites such as those MacDonald and Alexanders of R1a ydna who descend from Somerled, King of the Isles). Genetic dna studies have demonstrated that the bulk of the peoples of Britain and Ireland (before the recent influx of immigrants) are overwhelmingly of Gaelic R1b -L21 ydna. 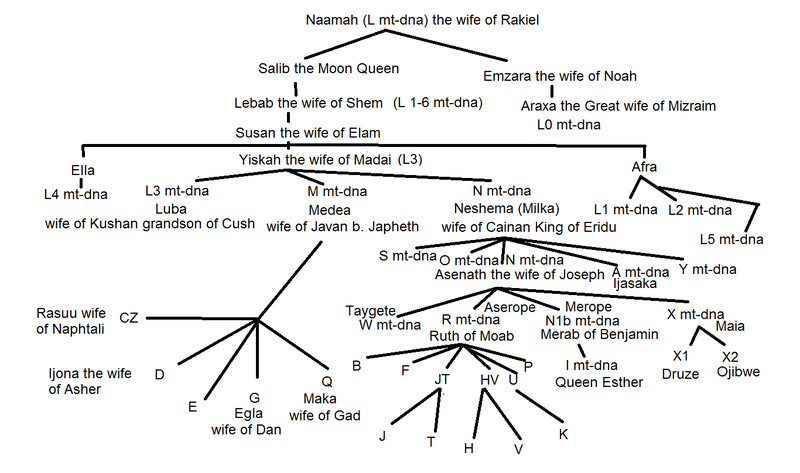 My research now demonstrated to me that this is the ydna of the Davidic House of Nathan. Thus I now realised that Shakespeare was correct when he called Britain -"this royal throne of kings, this sceptred isle"- as they are truly the Isles of King David and his seed. Previously I had believed that the British throne was the throne of King David but now I realised that the bulk of the people were also Davidic descendants. The Stuart Dynasty belonged to R1b- L21 and thus on the direct male line were descendants of King David as were most of the Irish and Scottish Kings before them. However Judaism teaches that one can have Davidic status through a female. Thus the famous Hillel and Gamaliel were considered Davidic even though they were from the marriage of a man of the Tribe of Benjamin with a Davidic heiress. Our present Queen Elizabeth II is a Davidic Queen through the female line even though her family's male line is from the Tribe of Zebulon. Prince Phillip her husband however is most likely of R1b-L21 as is the last Czar of Russia and are thus of direct male line Davidic ancestry like the bulk of the so-called Anglo-Saxon-Celtic people. My dna study has confirmed that many of the Dutch and Germans belong to Zebulon (R1b U106). I have concluded that Zebulon which came to Europe long before the Assyrian Exile by their ships with the Phoenicians is R1b U106. These are the Hellenes or Danaan of the Iliad or Odessey which were found in the north of Europe not the south. The Zebulonites who went via the Russian Steppes with other Israelite tribes are R1b L238/S182. However the Saxons who the British Israelites referred to as being sons of Isaac are in fact mainly sons of Issachar and their ancestors were known as the Sacae. Sacae, Saka or Sakkai (Scythians) is a diminutive of Issachar rather than Isaac. I had once believed that the Russians and the Slavs were of the tribe of Issachar. Now I was shocked to realise that it is in fact Russia and the Slavic nations are that Nation and Company of nations that belong to the Tribe of Ephraim (R1a Z283). My former belief that many of the French were Reuben has been confirmed by dna evidence as the ydna of the Tribe of Reuben (or at least the main bulk of Reuben) is R1b U152. Both the Plantagenet dynasty (except the House of York) and the Habsburgs belong to R1b U152 and the Bourbon dynasty to Zebulon (R1b U106). That many of the Spanish and southern French are Simeon has also been confirmed as the Tribe of Simeon mainly belong to R1b DF27. My belief that in the north of Europe was to be found the Tribes of Naphtali and Dan was to be found mostly correct with N ydna [the ydna of Naphtali and Dan (plus P*)] found there in abundance especially in Finland and the Baltic States. N ydna is the the ydna of the later Rurikovichi rulers of Russia descended from Ruling Prince Igor. I was also surprised to realise that many Asians also belong to the Lost Tribes of Gad and Asher (O ydna). While the British Israelites may have been wrong on their Identity of Ephraim and some of the other Tribes I have gained immense riches from my reading of their literature in regards to the migrations of peoples. 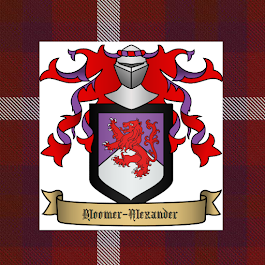 This interest increased my love of history, genealogy, folklore, fairy tales, legends, mythology and heraldry. Though I now realise that the envy between Ephraim and Judah is not between the British and the Jews (in fact the British are mostly descended via David from Judah) but is the envy between the Jews and British on one hand and the Russians and Slavs on the other. The Slavs descend from the Persians and Parthians of the Tribe of Ephraim through the Wends (Voni or Vonones clan of the Parthians) . The various genetic studies have also demonstrated that the Kelts of Europe are mainly from R1b U152 (along with some other groups especially Syrian G haplogroup) and the so-called Celts of Britain and Ireland are not descended from them but came to the British Isles by way of Spain. The Reubenite Kelts of Europe (U152), the Davidic Gaels and Cymri of the British Isles (L21), the Simeonite Iberians and South Western French (Senones) all descend from R1b S116 (P312) haplogroup, as well as the Issacharite Anglo-Saxons (R1b DF19 ydna), from before 600 BC (by my revised chronology but 721 BC in the Accepted Chronology of Academia). This common genetic source is not found in Europe but far to the east in the Levant. While the bulk of the Lost Israelites descended from R1b are in Western Europe (though there are also large numbers found in Africa and Central Asia and the Middle East) they are not all of the lost Tribes. In reality most of Europe and much of Asia are today descended from the lost Tribes of Israel. This reading of the dna evidence to find the Lost Tribes can only be done if one puts aside the evolutionary based methodologies for dating dna which are ridiculously too old. Do I still think America represents Manasseh (R1a-Z93 and R1a L664)? Possibly, as many of the Ashkenazi Jews belong to Manasseh as do many of the 19th century German immigrants as well as certain groups from British ancestry. 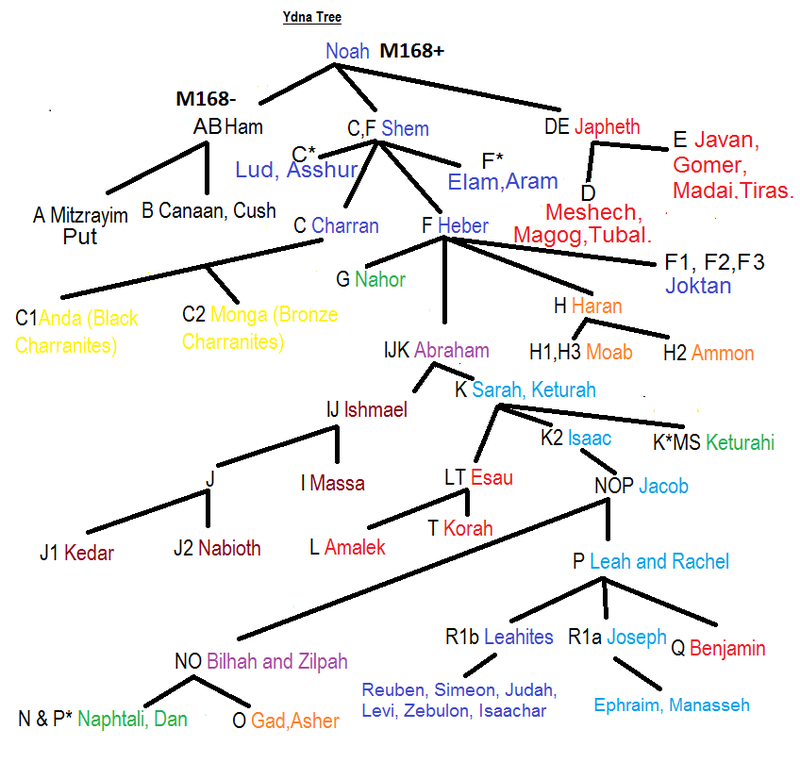 R1a-Z93 is Eastern Manasseh and R1a L664 is Western Manasseh (Dorians of ancient Greece). The little Tribe of Benjamin (Q ydna) is found among the American Indians and other places throughout the world including Europe. The Assyrian enemies of the lost Israelites belong to the Ishmaelite I ydna (Royal Assyrians) and J2 ydna (also found among the Samaritans). J1 are the Ishmaelite Arabs and some of the Samaritans. Jewish Kohenim (priests) of J1 and J2 origin are in fact originally Samaritan priests who converted to Judaism in Second Temple times. The priests directly descended from Aaron on the male line belong to R1b. The Edomites are not found among the Ashkenazi Jews in any significant numbers as they are of LT ydna. Many of the ancient Romans belonged to T haplogroup which Jewish tradition has always associated with Edom. Am I still a British Israelite? Yes and No. While I believe in the Israelite identity of the British I do not believe they are the birthright nation and company (commonwealth) of nations. I believe the birthright nation and commonwealth of nations to be Russia and the Slavic majority countries such as Poland. Does Britain have a role to play in prophecy? Yes they do as they represent the House of David and from this House will arise the Great Catholic Monarch called Henry the Lion to deliver Europe and the world. Besides the tribal identity of Ephraim with the Slavs I continue to believe that Ephraim or Joseph represents the Church just as Judah represents the Synagogue no matter what ones ydna happens to be. I continue to pray for the reunion of the stick (tree) of Joseph and the stick (tree) of Judah into one fellowship in unity but not uniformity. Hello CatholicJew, you should create a timeline from Adam that includes all of the inter-planetarium events matched along side Biblical events as for comparison. For example, the date of the fall of Atlantis and what was going on Biblically at that time for perspective.